Tanks became the undisputed kings of the battlefield — lumbering steel boxes that crushed everything in their path while shrugging off machine gun and rifle fire. 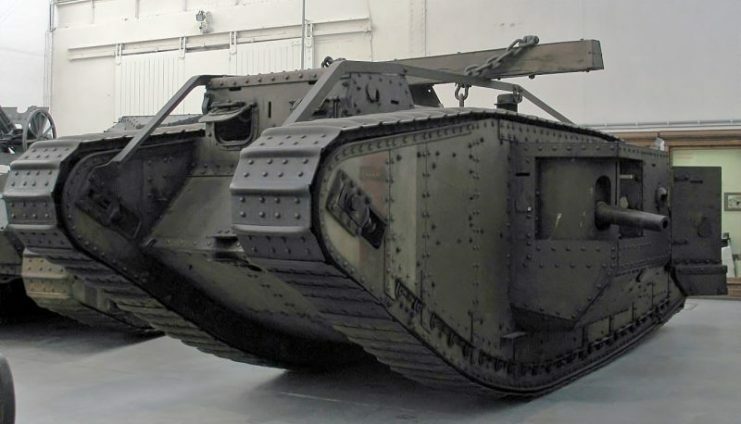 However, tanks of WW1 and even early WW2 were not very heavily armored. They were built initially out of thin steel plates riveted together at right angles. This meant that the armor was relatively easy to penetrate. Another problem was that close hits and explosions would bust rivets, sending the heads flying about the tank like shrapnel. This led to the crews wearing chainmail armor to protect themselves inside the tank. The only effective defense against tanks was the close range deployment of field guns to blow them apart. This, of course, meant that you not only had to have the correct gun in the first place, but you also needed to live long enough to use it. 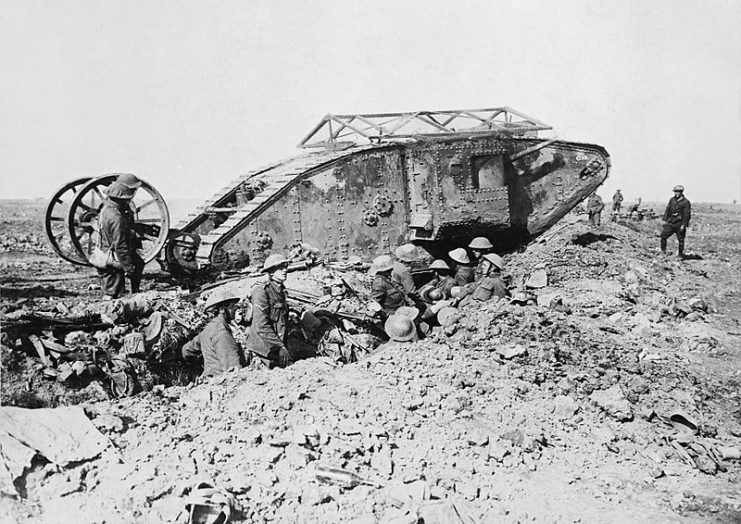 British Mark I “male” tank near Thiepval, September 25, 1916. A field gun is a huge target, and just about impossible to move around at speed on the battlefield. The Allies at least had a small 37mm cannon that was portable, while the Germans were dependant on larger 77mm guns. The Germans, being on the receiving end, were the first to research ways for infantry to stop tanks. Their answer was to take the Mauser rifle and put it on steroids. Officially called the Mauser Tank Gewehr M1918, it was a massive single-shot bolt-action rifle firing a 13.2mm armor-piercing steel-core bullet. Huge and unwieldy, it was a beast that was realistically too big for one man to move easily. Additionally, it was punishing on both ends since the shooter often received a bruised shoulder upon firing. For the tanks of that era though, the Mauser T-Gewehr was a deadly threat if used correctly. Fired at vision ports and weak spots like seams or track links, it was possible to disable or at least render the tank immobile. The British in WW1 mostly confined their attempts to using African big game rifles for the same purpose but with less success. In the 1930s, as Germany re-armed, Britain began to get worried about what to do against a new generation of faster tanks. 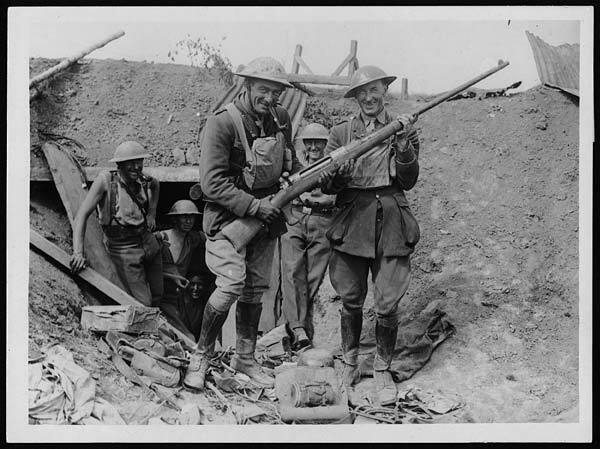 Approved in 1937 and named for the officer in charge of British small arms design, the Boys Anti-tank Rifle was Britain’s great hope. Against the first generation of Panzer Marks I and II, it was initially effective if somewhat underwhelming. Walt Disney even produced an animated training film showing how to use them which probably did more for the rifle’s prestige than its performance in combat. The Finns had better luck with borrowed ones which they used against early Soviet tanks. Those tank, however, were small under-armored vehicles hardly worth the name. 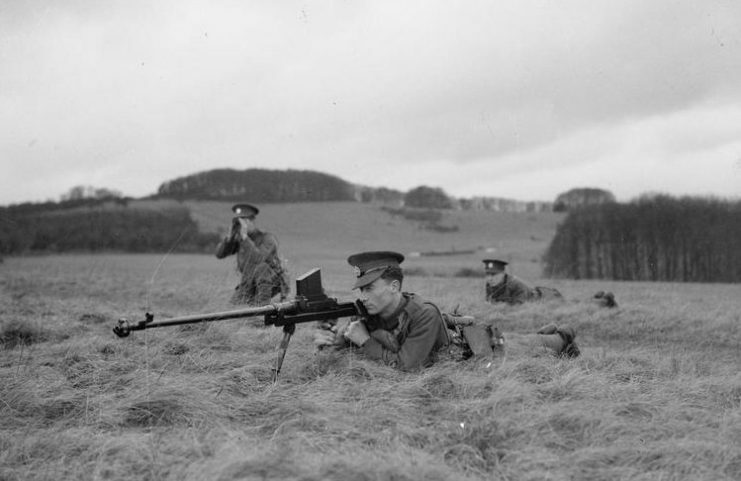 Soldier of The Rifle Brigade prepares to fire a 0.55 inch Boys Anti-tank Rifle during a military exercise, 1938. The Boys went on to a more successful career against Italian trucks and armored cars in the African Desert Campaigns. This would be a foretaste of how modern anti-materiel rifles would be used. 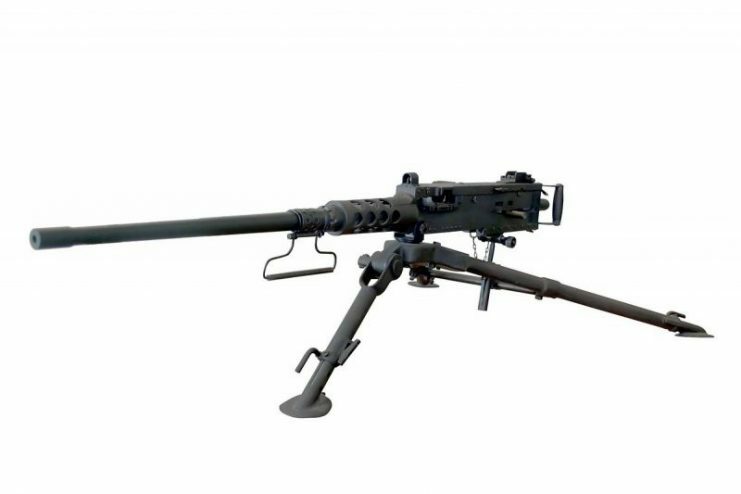 The other well known anti-tank rifle is the Lahti L-39. This semi-automatic 20mm weapon is really not a rifle, more of a mini cannon, with its 100 plus pound weight and sled mounting. Its short but active career saw it used in its intended role as well as being used as an improvised AA gun. After the Soviets produced heavier tanks, it was quickly relegated to the anti-truck role. Surplused out in the 1950s and 60s, many will remember the vintage ads where you could buy these out of the back of American Rifleman Magazine. Probably the strangest anti-tank rifle out there was the Swedish Carl Gustaf. This was a single shot recoilless gun that worked by firing a special round that vented propellant gas to the rear to cancel the recoil impulse. This mechanism allowed it to be very light and easy to carry but also resulted in the weapon itself looking like some random assortment of pipes cobbled together. 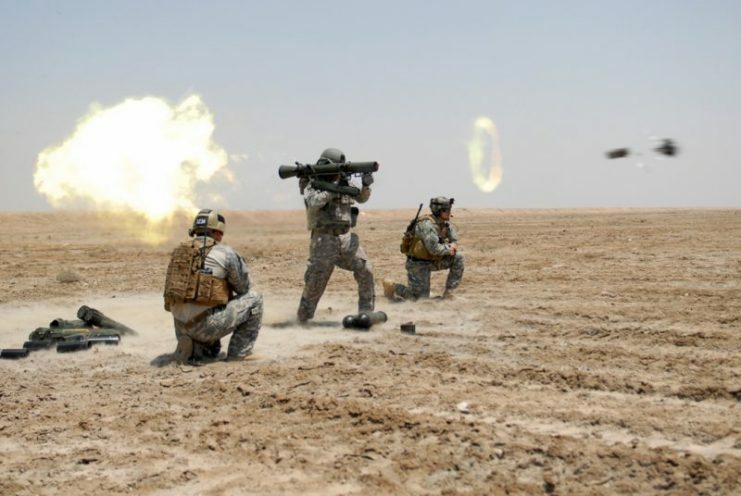 Firing off a Carl Gustaf recoilless rifle, showing the propellant gas backblast. Having personally handled one, it would have been nicer than the Lahti to drag around all day, but the fast extra shots of the Lahti might have made up for it. Also, the back blast of the M-42 made it dangerous to use undercover or be around when firing. The firing signature and noise were much worse than comparable weapons of the same caliber. 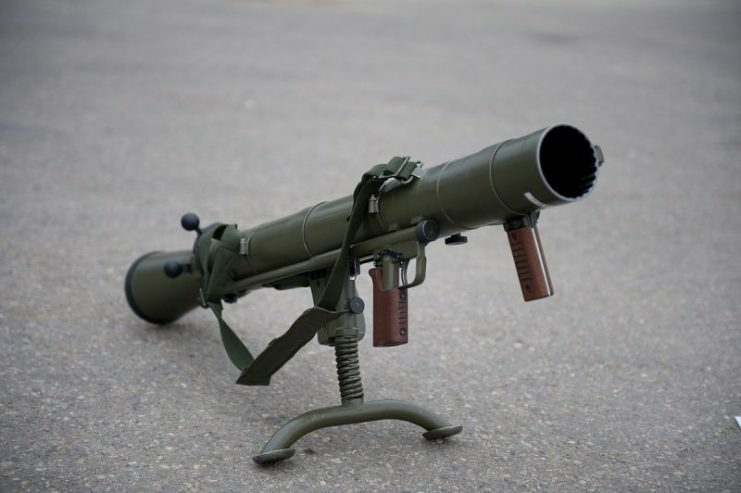 Ironically, its descendants actually live on in military service as the 84mm Carl Gustaf recoilless rifle. With significantly improved warheads and a special backblast system, this weapon is used by many countries as a portable tank killer. 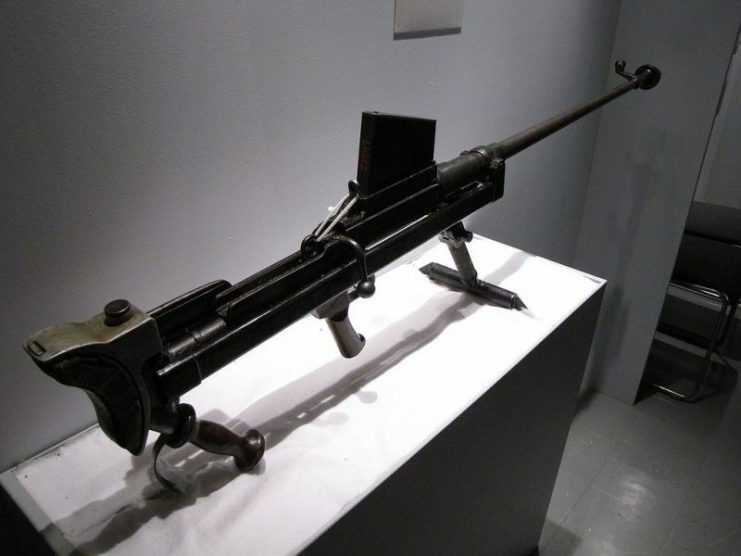 You may have noticed that I didn’t mention anything in regards to the US when it came to anti-tank rifles. This is for two reasons. 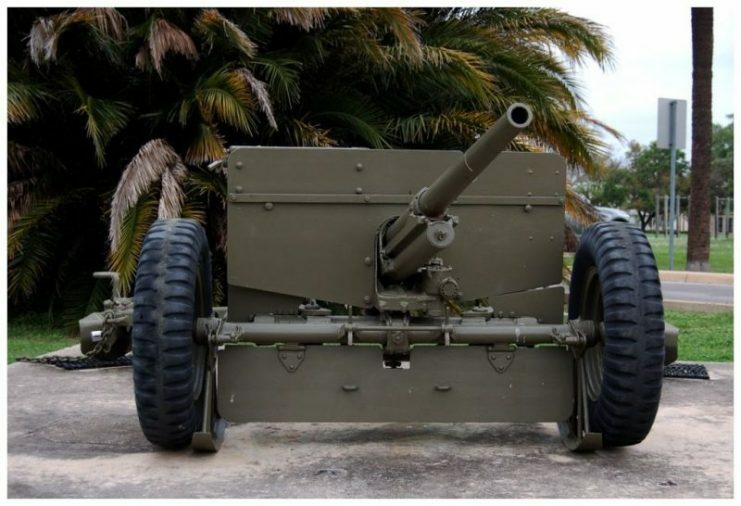 Firstly, the depression era military didn’t have the funds to spend on extra weapons, and they had already placed their bets on the 37mm cannon as their anti-tank weapon. 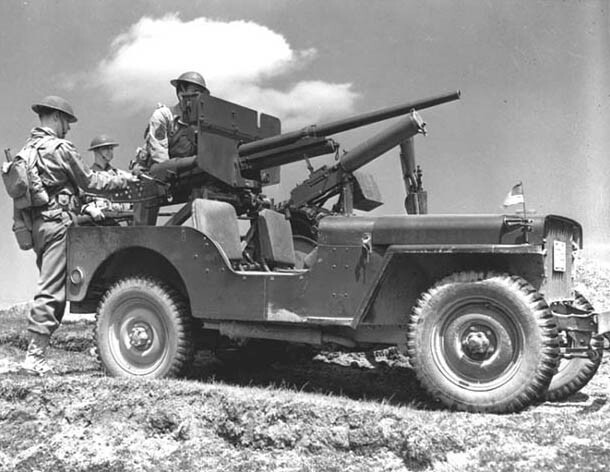 Ford jeep fitted with M3 gun. 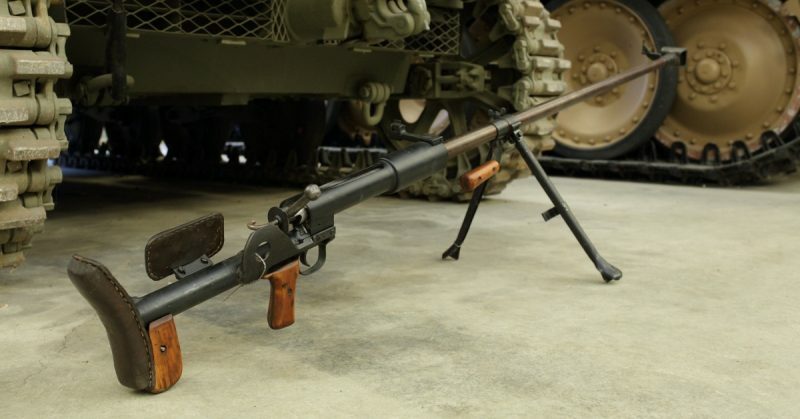 The second reason is one you may have heard of: the Browning M2, a .50 caliber machine gun. Developed in the 1920s, it fired a round derived from the Mauser M1918’s 13mm round. Used in every war since then, it has functioned as everything from an anti-vehicle gun to an anti-personnel and anti-aircraft weapon. 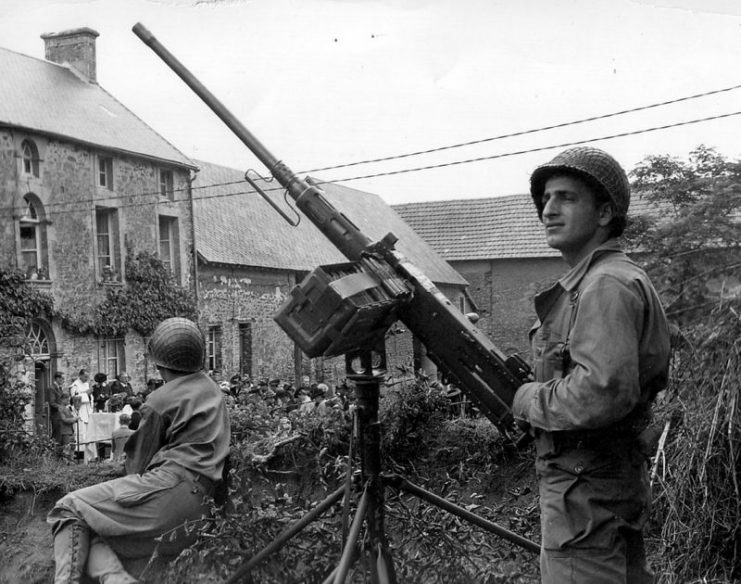 As the Americans had both this and the 37mm gun, there was really no need for a further specialized anti-tank rifle. 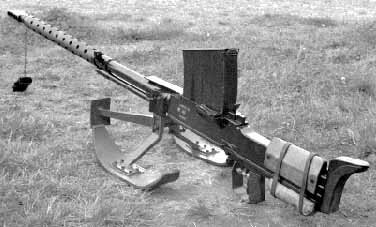 Anti-tank rifles could really only exist in the circumstances presented by warfare before the 1940s. Once obsolete, they were never going to regain supremacy. However, they haven’t entirely passed from the scene. Their legacy does live on as stated in modern-day anti-materiel rifles chambered in some instances up to and above the old anti-tank caliber of 20mm.